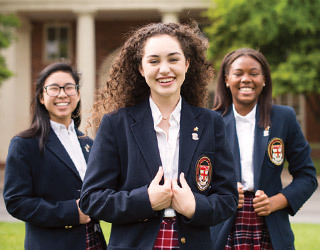 Ursuline relies on the generous support of donors as partners in educating young women for leadership. Contributions provide essential funds for financial need-based scholarships, competitive faculty compensation and professional development, long-term facilities maintenance, and other operating costs not covered by tuition. There are many ways to give to Ursuline, and all help ensure the success of the school and our students. 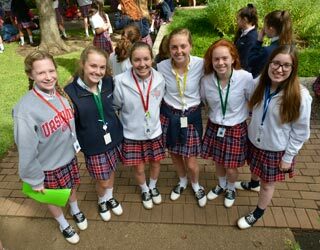 Ursuline’s pledge program offers an opportunity for payments over two to five years, depending on the project and size of gift. 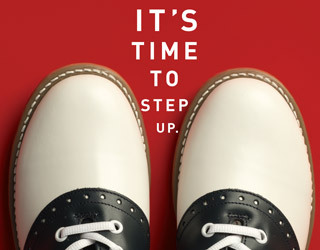 Pledge giving is both flexible and tax-wise, allowing you to schedule charitable deductions in years that provide the most significant tax savings. Your pledge is recorded by completing a pledge card or letter of intent. Invoice arrangements are available. 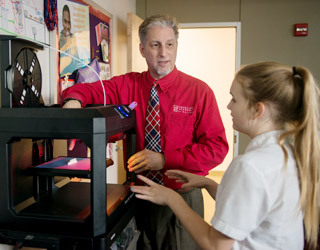 Many employers generously match an employee’s gift to non-profit institutions, providing another avenue for additional contributions to Ursuline Academy. If your employer will match a gift, the company’s matching gift form should be submitted with your own cash or pledge gift. Direct gifts of securities, especially appreciated stocks, can offer substantial tax savings. Federal income tax laws allow for deduction of the full market value of long-term appreciated securities, subject to an annual limitation of 30% of adjusted gross income. Any excess may be carried forward for five years. By giving appreciated stock, you may give a larger gift at less cost. For securities that have decreased in value, donors benefit from selling the stock and taking a loss for tax purposes, then contributing the cash to Ursuline. Ursuline may accept gifts of houses, residential or commercial rental property, office buildings and undeveloped land. You can also make a gift of a personal residence, reserving the right to live in the house. This type of gift is called a “Life Estate Contract,” offering the donor a substantial charitable contribution deduction based on the value of the remainder interest in the residence. You can establish a separate life income trust to provide wither a variable or fixed income, creating a charitable deduction for the remainder interest donated to Ursuline. Transfers are exempt from capital gains tax. The Charitable Remainder Unitrust provides income for you or a designated beneficiary based on a payout rate not less than 5% of the fair market value of the trust assets, determined annually. Income from the trust continues for the rest of your life, and in certain cases, may be passed on to a survivor. You may also establish an income interest for a parent or other individual you wish to support. With a Charitable Remainder Annuity Trust, the required annual income distribution amount is predetermined at a maximum of 5% of the fair market value of the Trust assets at the date the assets are transferred to the Trust. When planning your estate, you can consider an outright bequest to Ursuline Academy. Also, certain bequests in trust are not subject to estate taxation. Because of special statutory tax benefits that are granted for charitable contributions, your exclusion is the face value of the gift rather than the actual cost, which may be considerably less. Many memorial funds have been established at Ursuline Academy in memory of a deceased relative or friend. In-kind gifts afford you the opportunity to donate valuable items, property, or professional services to Ursuline Academy. Examples include auction items for special events, office furniture, products and services for new construction and building renovations, legal and accounting services, etc. Ursuline Academy of Dallas is a non-profit 501(C) (3) organization. All contributions to the Academy are tax deductible to the extent allowed by law.